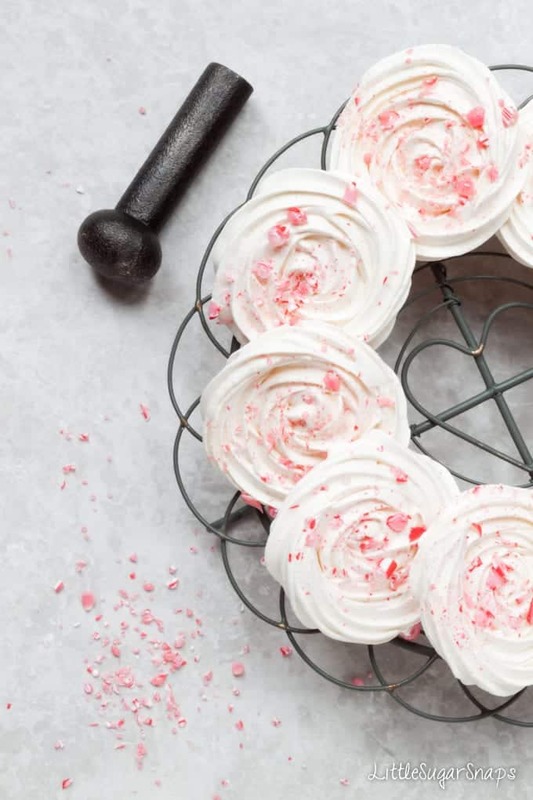 Chocolate Peppermint Meringue Sandwiches make a wonderfully fun addition to your festive dessert options. The crispy shells give way to a soft mallowy meringue & a cool white chocolate centre. 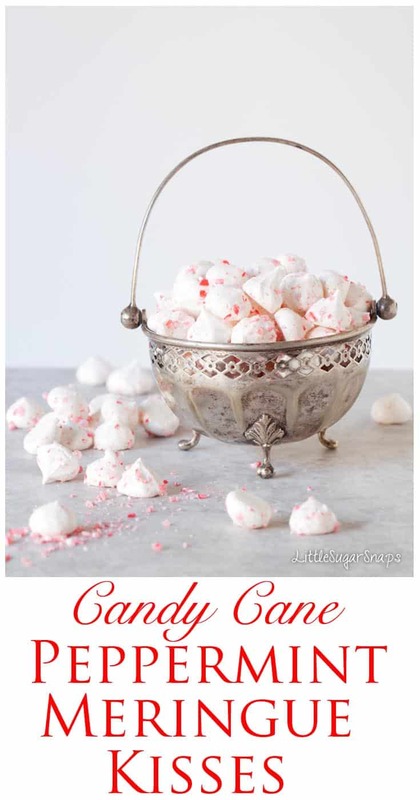 The sprinkling of crushed candy canes is both divinely pretty and deliciously minty. Meringues are one of life’s little wonders that have grown on me in adult life. As a kid I could take them or leave them. Unless my Mum’s Lemon Meringue Pie was on offer and then I would take, take, take. But as I’ve progressed in baking and made my own meringues, I’ve learned how vastly superior the homemade version is to the oh-so-sweet store bought ones that sit on the supermarket shelf for months… possibly years. A good meringue is sweet, yes. But it’s more complicated than that. It is crisp, yet soft inside and the sweetness is surprisingly subtle. Homemade meringue is also incredibly adaptable. You can flavour it, colour it and shape it exactly as you see fit. Now, my girls have a soft spot for candy canes – every year they put one on their list to Santa. They also adore meringue, but Santa does not deliver that (too fragile – think of the crumbs). So last New Year I decided to dive in and create something pretty, minty and meringue-ified for them. 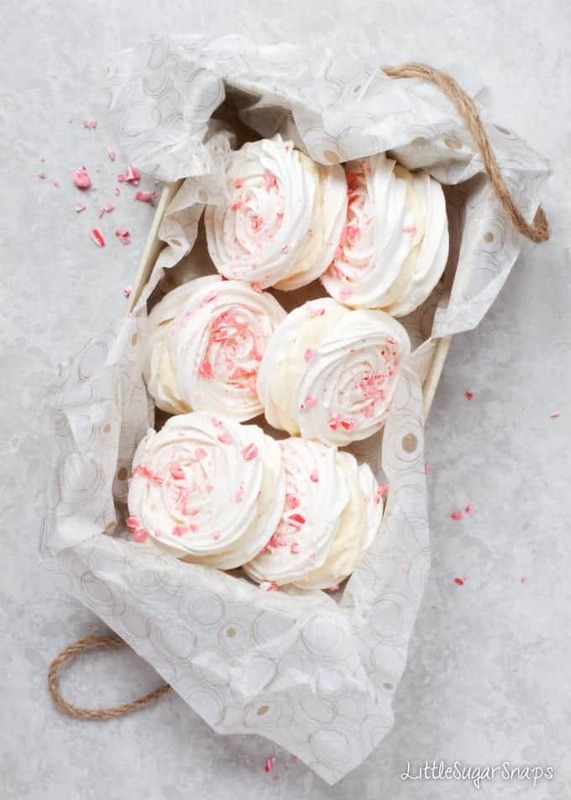 The result was these Chocolate Peppermint Meringue Sandwiches: classic French meringues first dusted with crushed peppermint candy canes then lavishly sandwiched together with a white chocolate & mascarpone cream. The meringues have a delicate crisp shell, yielding to a soft and pillowy middle. 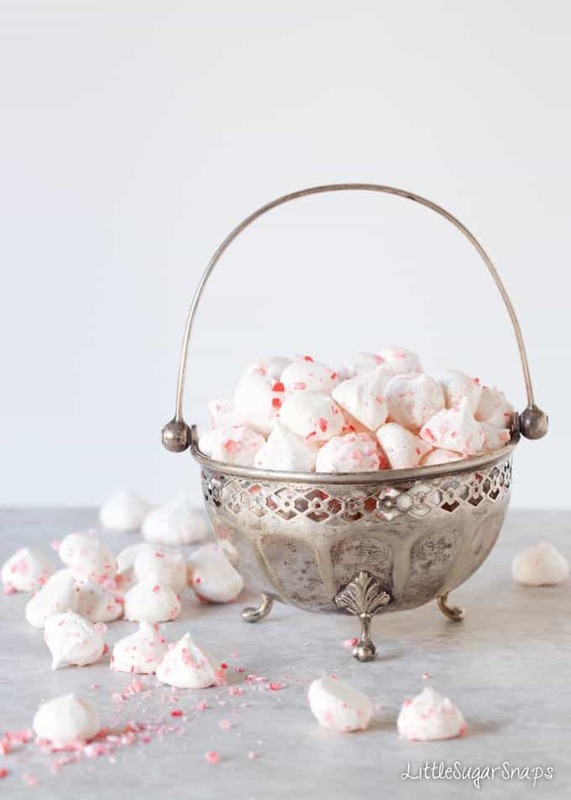 The hit of peppermint balances the sweetness from the meringues and the creamy centre perfectly. 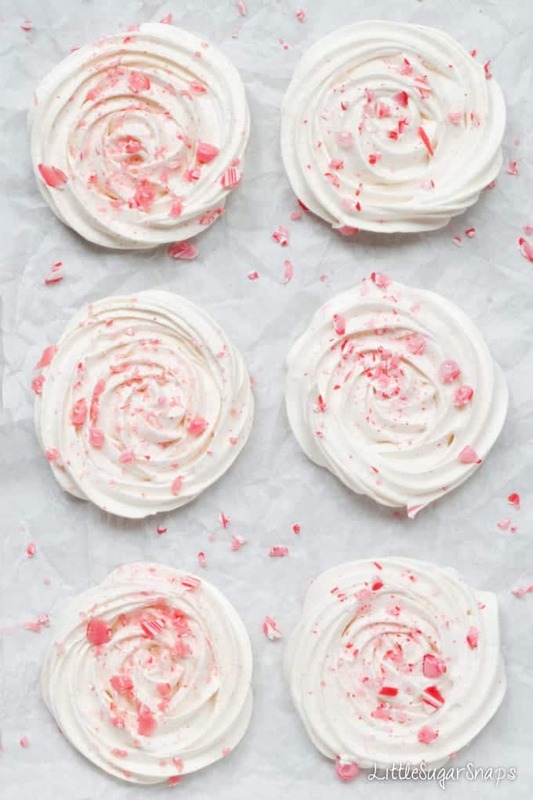 Make them large or small, it’s really up to you, but don’t make the mistake of thinking these Chocolate Peppermint Meringue Sandwiches are just for the kids. 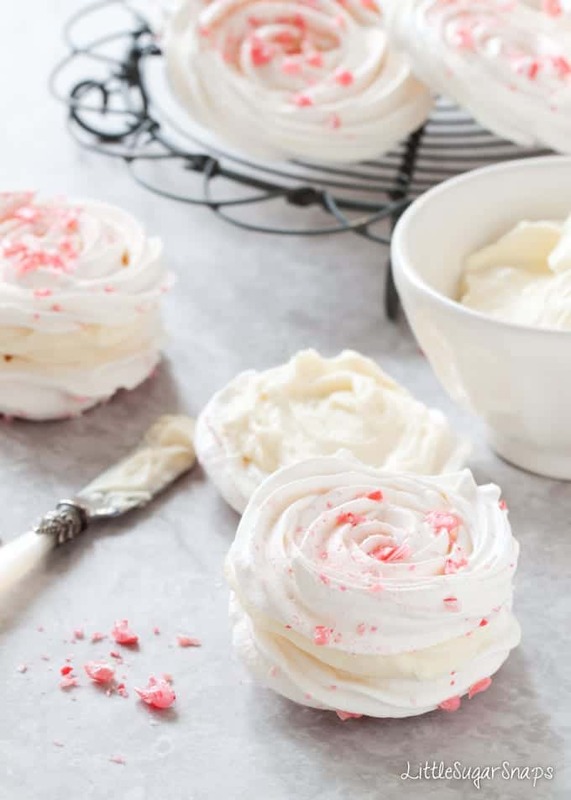 They are a marriage of quality homemade meringue, creamy heaven and a large dose of fun. All in all, they are a cheeky union that adults must not miss out on. Of course, you can skip the filling and just make the meringues – any size you want. Personally, I think they are gorgeous as tiny meringue kisses that could be served after a meal with coffee or perhaps to top a cream-loaded hot chocolate. I mentioned that these Chocolate Peppermint Meringue Sandwiches use classic French meringue. Which begs the question: what is French meringue? As it’s Christmas, I thought I’d spoil you by helping to de-mystify meringues. 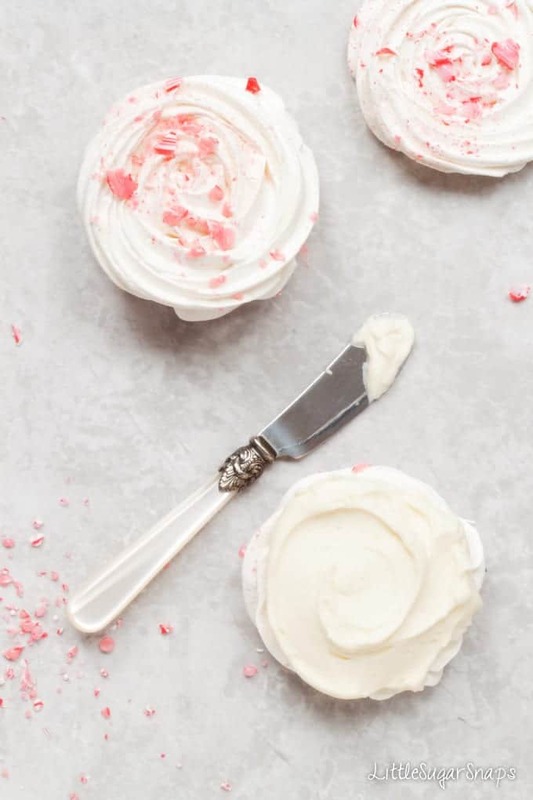 I’ve compiled a quick low-down of the most common types of meringue out there and some helpful baking tips to take you to the top of the meringue masterclass. French meringue is the easiest and quickest to prepare and for that reason, it comes as no surprise to find that it is the most commonly baked meringue. French (cold) meringue is made by whisking egg whites until the soft peak stage then adding the sugar a teaspoon at a time, whilst continuously whisking until all of the sugar has been incorporated and the meringue is glossy, thick and smooth. It can be spread or piped but it must be baked immediately after mixing to prevent the egg whites and sugar from separating. Use to create dessert shells, cake layers and pavlova bases. Swiss meringue is prepared by gently beating egg whites and sugar in a bain marie. Once the sugar has dissolved, the meringue is whisked until cool, by which time the meringue will be firm and glossy. It is smooth & silky and makes a great base for a luxurious buttercream icing. It can also be piped into cookies or made into other shapes, then baked like French meringue. Italian meringue is made using boiling sugar syrup in place of caster sugar. The hot syrup is drizzled into softly whipped egg whites and whipped until the meringue is stiff and cool. Italian meringue is much more stable than French Meringue – there is much less chance of the ingredients separating. This type of meringue can be eaten without being cooked further and is great to decorate pies or cakes. Alternatively, it can be used to cover Baked Alaska and cooked briefly until it colours. It is important to keep your egg whites and all of your equipment grease free – spotlessy clean mixing bowls and beaters are essential. On this note, avoid plastic mixing bowls, since these tend to cling onto grease. Glass, stainless steel, ceramic or copper bowls are much better. The French meringue used in my Chocolate Peppermint Meringue Sandwiches is the easiest of all meringues to master – just allow yourself sufficient time to whip in the sugar and crisp, snow white shells will be your winter reward. Leftovers can be chilled for up to 2 days, but the meringue will soften significantly. They are certainly still edible and just as delicious, but you will need a spoon! Wow, these look absolutely wonderful Jane.This is a recipe I will definitely be trying. Thankyou Sarah. My kids go crazy for them – I’m sure your’s will too. 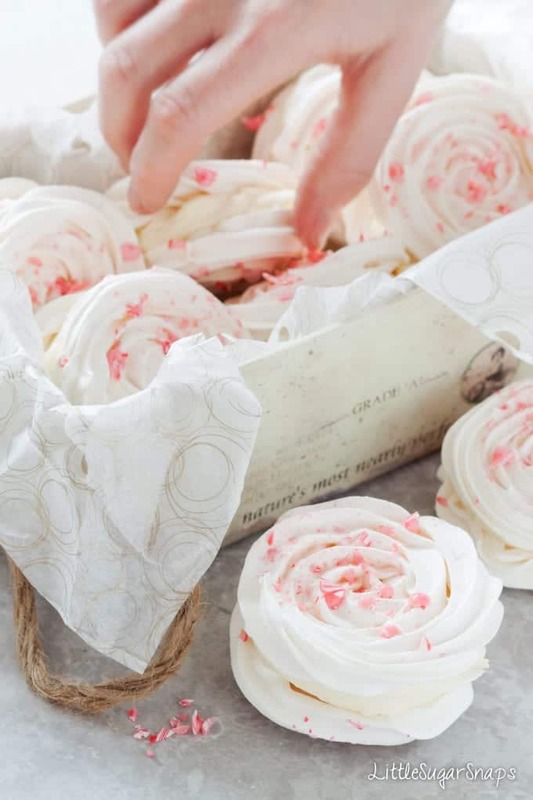 These are such a pretty and festive treat! I love the color!